Enjoy the top 37 famous quotes, sayings and quotations by Mikko Hypponen. 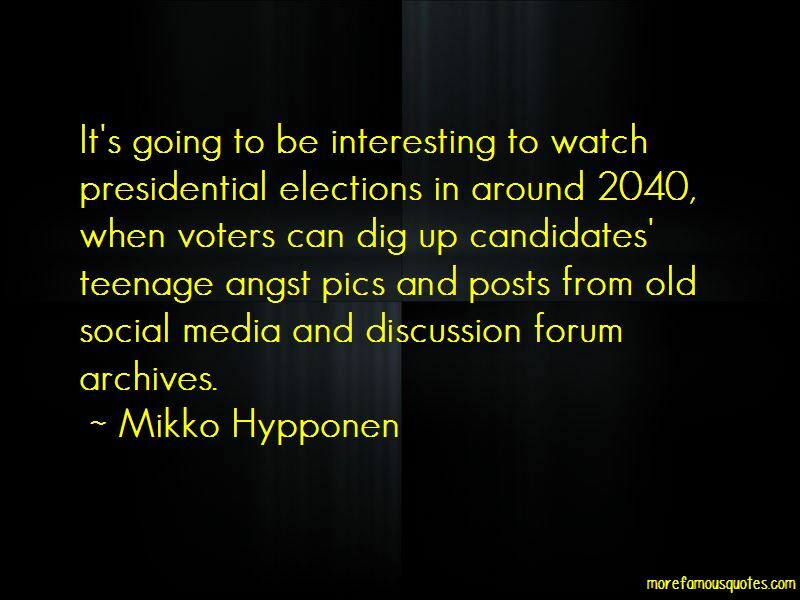 It's going to be interesting to watch presidential elections in around 2040, when voters can dig up candidates' teenage angst pics and posts from old social media and discussion forum archives. How many of the 'Fortune' 500 are hacked? 500. Nuclear scientists lost their innocence when we used the atom bomb for the very first time. So we could argue computer scientists lost their innocence in 2009 when we started using malware as an offensive attack weapon. Today, in 2011, if you go and buy a color laser printer from any major laser printer manufacturer and print a page, that page will end up having slight yellow dots printed on every single page in a pattern which makes the page unique to you and to your printer. This is happening to us today. And nobody seems to be making a fuss about it. There is a difference between the stuff that people put online themselves, like pictures and their trips and flights and meals they've eaten, than the stuff that they don't realize is also going into foreign computers. Like, for example, copies of your emails or every single online search you ever do, 'cause all that is being recorded as well. Anonymous is like an amoeba: it's got too many different operations run by truly different people which might not share a single person with another operation, but they use the same branding - they are part of the Anonymous brand, just like al-Qaida. U.S. intelligence has the legal right to monitor foreign communications as they go through to U.S. service providers. However, even though something is legal doesn't make it right. I'm not American; I don't really care about what data is being collected about American citizens. I'm worried about us, the foreigners. I see beauty in the future of the Internet, but I'm worried that we might not see that. I'm worried that we are running into problems because of online crime. Online crime is the one thing that might take these things away from us. 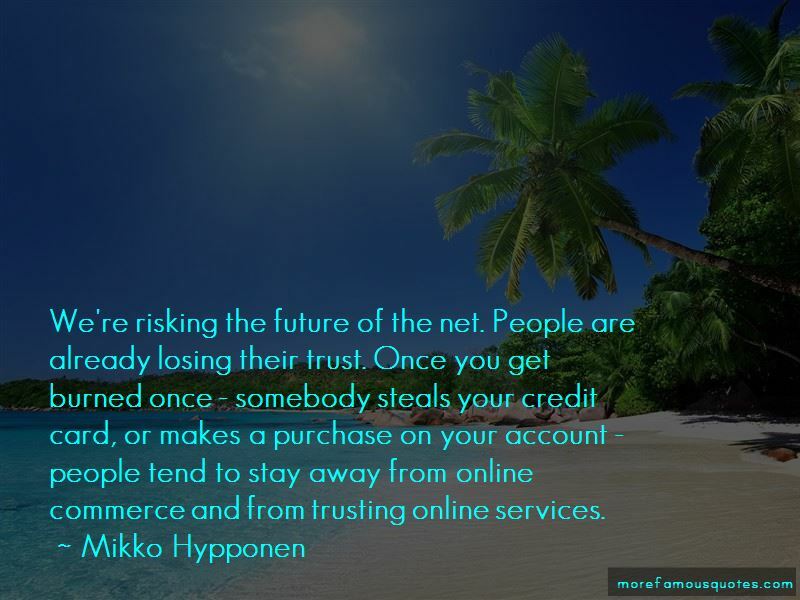 Want to see more pictures of Mikko Hypponen quotes? 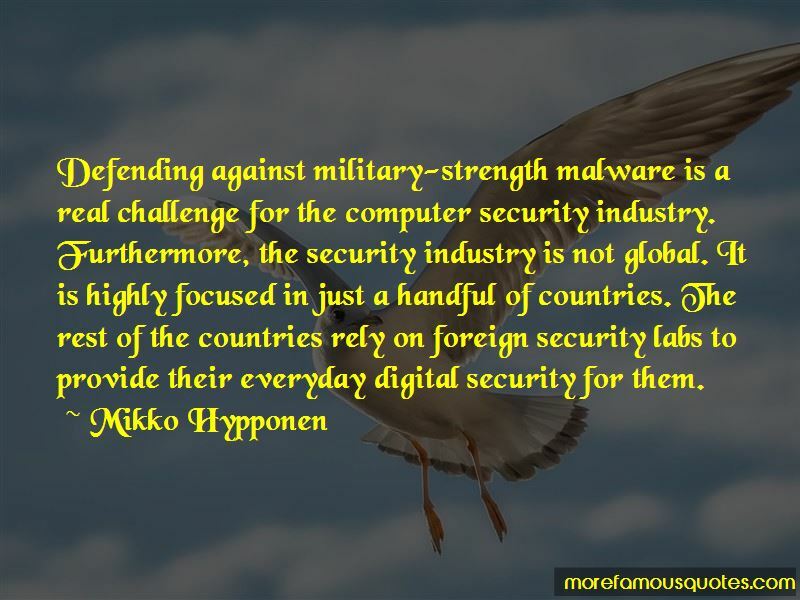 Click on image of Mikko Hypponen quotes to view full size.